Our 21 inch gnomes were not big enough they said. So we released our Large 32 inch gnomes and still people wanted bigger. HUGE they demanded. Ridiculous and Enormously Gargantuan was requested. Something for a knockout display, or just to send the neighbors or in-laws into shock! Behold finally, our Newest and LARGEST GNOME ever offered, the 8.5 Foot GIANT Garden Gnome!!! 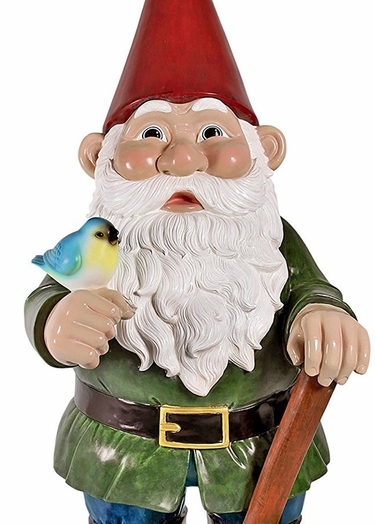 Hand-cast using real crushed stone bonded with a high quality resin, each Giant Gnome is individually hand-painted, and comes delivered with care by freight truck on a single pallet. This monstrous gnome will be the end-all of all conversation starters and a super high-impact piece at any location or in any large yard. This is the Mega-Mother of all Gnomes! Comes delivered in two pieces; from toe to top of head about 6 feet tall, and an extra 2 feet taller when you add the hat on top. Get ready for this HUGE Surprise with our 8.5' GIANT Garden Gnome!